Kevin Garnett went to the bench for good with 5:47 left in the third quarter, having scored only 8 points. No, he wasn't hurt, nor did he foul out. In fact, the unselfish Celtics couldn't have asked for anything better than this. 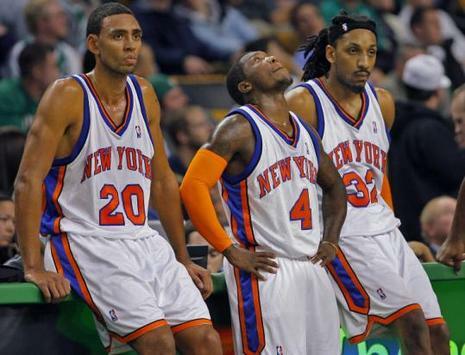 Say hello to the 2007 New York Knicks. Clowns to the left. Jokers to the right. As dysfunctional families go, the Knicks make the Osbournes look like the Cleavers. This team needs Dr. Phil more than it needs Dr. J or Dr. Jack Ramsay. Tony Allen can't catch a break with either leg. The Celtics guard missed his second straight game last night with a right thigh injury suffered Saturday at Charlotte. And after last night's game against the Knicks at TD Banknorth Garden, the 6-foot-4-inch, 213-pounder did not make the trip to Miami for tonight's game. Allen is "angling" to return Sunday against Cleveland and plans on rehabbing his injury at the Celtics' practice facility in Waltham today and tomorrow.